Seattle Metblogs » Volcanoes For Mom! 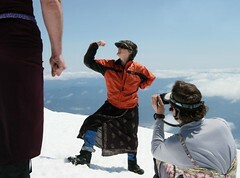 What better way to honor your mother than by climbing 5600′ up an active volcano in a dress? Yesterday, throngs of moms and mom supporters climbed Mt. St. Helens. It was a beautiful day to be above the clouds!